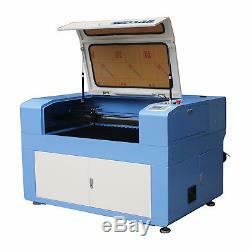 RECI 100W Laser Engraving & Cutting Machine 900mm600mmLaser Engraver & Cutter M900(35.4"23.6") CO2 Laser Tube with CE, FDA. Working size: 900mm600mm(35.4"23.6") Laser tube type:CO2 glass sealed laser tuber Laser power: RECI 100W Drive type:Micor Stepping Motor Max speed:100mm/s Control system:Top Wisdom Resolution:2500DPI PC interface:USB Soft Ware: Autolaser Image form: PLT, DXF, BMP, AI, DST etc. Package:Standard wooden case for export. Ketch map of optical system. The laser beam is from laser tube, then reflecting mirrors and focus lens, as following. More friendly control panel with Color Screen. Engliish, French, and more language.. One key to install, more convenient. Output from Auto CAD directly. 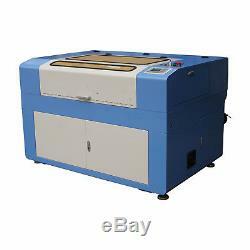 Economical Laser Engraver & Cutter M900 is most suitable and the preferred choice of equipments in industries such as advertisement, gifts, shoes, toys, and ect. Materials:Acrylic, plexiglass, fiberglass, laminated plastic, rubber, marble, leather, crystal, bamboo, clith, fabric/denim, plastic, paper, wood, MDF , anodized aluminum, coated metal, and etc. 1 60W Laser tube 2 Laser Engraving Software Package 3Air Pump 4Air exhaust fan 5 3 Reflect optics 61 Focus optics 7 Blade platform 6Moterized up and down platform, 400mm 7Water chiller 8 Communication cable. 1Upgrade to 130W Laser tube. 2Reddot Positioning Function(showing outline or laser dot position). 3Rotary(for engraving cylinder materials). 4Industry water cooling system CW5000/CW5200 Water Chiller. 5Auto Focus(just for machine with up and down table) 6CCD camera. 1We accept items return within 30 days from the date you receive it. 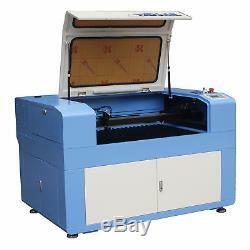 RECI 100W Laser Tube CO2 USB LASER ENGRAVING CUTTING MACHINE 900600mm" is in sale since Friday, October 28, 2016. This item is in the category "Business & Industrial\Printing & Graphic Arts\Screen & Specialty Printing\Engraving". The seller is "globalshopcnc" and is located in CN.